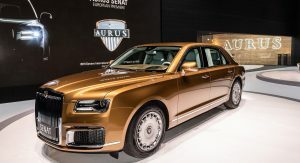 Bentley and Rolls-Royce are storied brands, but they’re getting some competition in the form of the Aurus Senat limousine and Senat sedan. 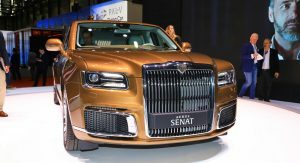 Currently on display in Geneva, these Russian-made luxury vehicles incorporate a number of Rolls-Royce styling cues and were prominently featured during Vladimir Putin’s inauguration last year. 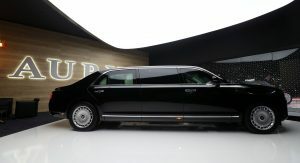 The most notable is the armored limousine which reportedly measures 21.7 feet (6,630 mm) long and has a massive 14.1 feet (4300 mm) wheelbase. 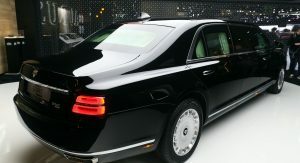 Those dimensions dwarf the Rolls-Royce Phantom Extended Wheelbase and even the old Maybach 62. 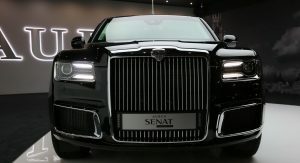 The Senat sedan is significantly smaller, but it’s not tiny by any stretch of the imagination. 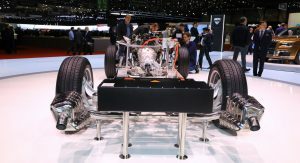 Instead, it measures 18.4 feet (5630 mm) long with a wheelbase that spans 10.8 feet (3300 mm). 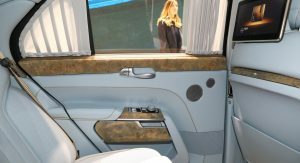 While the exterior styling isn’t exactly ground breaking, the cabin is undeniably luxurious as it features premium leather upholstery, wood trim and metal accents. 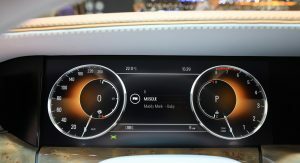 The cars are also pretty high-tech as they have a digital instrument cluster, a widescreen infotainment system and a dual screen rear entertainment system. 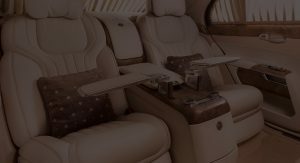 Like Bentley and Rolls-Royce, Aurus offers an extensive personalization service which enables buyers to customize virtually every aspect of the interior. 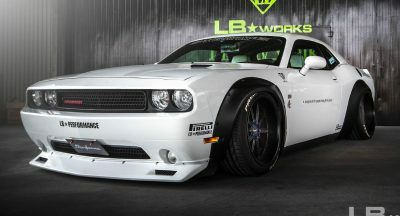 Power is provided by a hybridized V8 engine that produces 590 hp (440 kW / 598 PS) and 649 lb-ft (880 Nm) of torque. 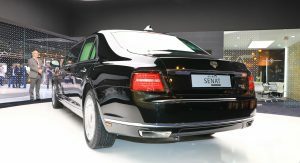 It enables the sedan to accelerate from 0-62 mph (0-100 km) in approximately six seconds, while the limousine can accomplish the same task in roughly nine seconds. 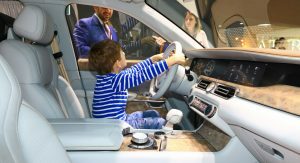 In terms of safety, the Senats come standard with an assortment of driver assistance systems including adaptive cruise control, automatic emergency braking and a collision avoidance system with pedestrian recognition technology. 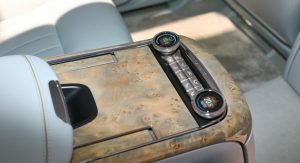 The model also has a blind spot warning system and a traffic sign recognition system. 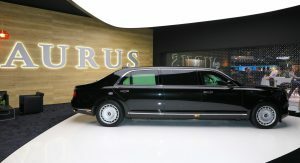 Aurus is currently accepting pre-orders, but noted production is extremely limited at the moment. 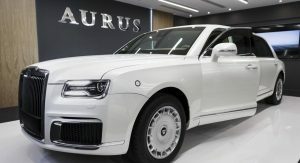 However, a new plant is slated to open late next year in Tatarstan and this should enable Aurus to boost production to 5,000 units annually. 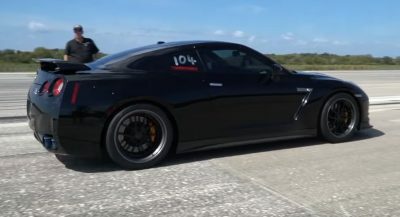 Looks really cool in black. Derivative styling but dictatorially menacing. 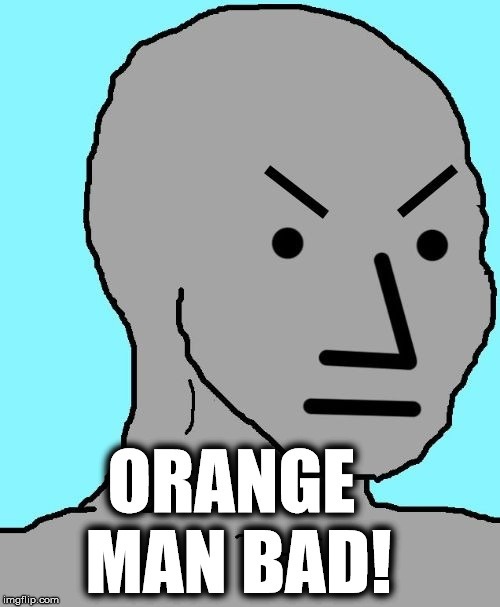 That is it exactly! I actually like it in a weird way. I’m holding out for the higher-end Kompromat model. Still looks goofy but respectable on the inside. 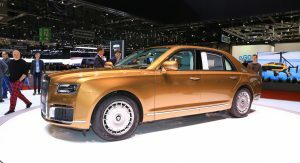 kinda sorta almost remind me of the old Kia Amanti/Opirus. I duuno, I just love the sheer excess of this thing! 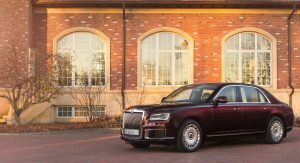 IT’S BETTER LOOKING THAN A ROLLS. 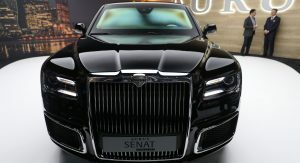 Actually I agree with him, the new Phantom looks like a Chinese knock-off of the old one. 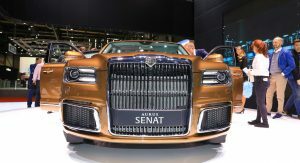 This Senat looks like a knock-off. Oh, it in fact is a knock off! THE WANNA BE DICTATORS LINE FORMS TO THE RIGHT. 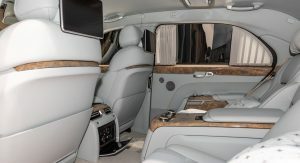 That interior looks about as luxurious as a 2005 lincoln towncar. Looks reasonably well made and that’s a bit surprising. 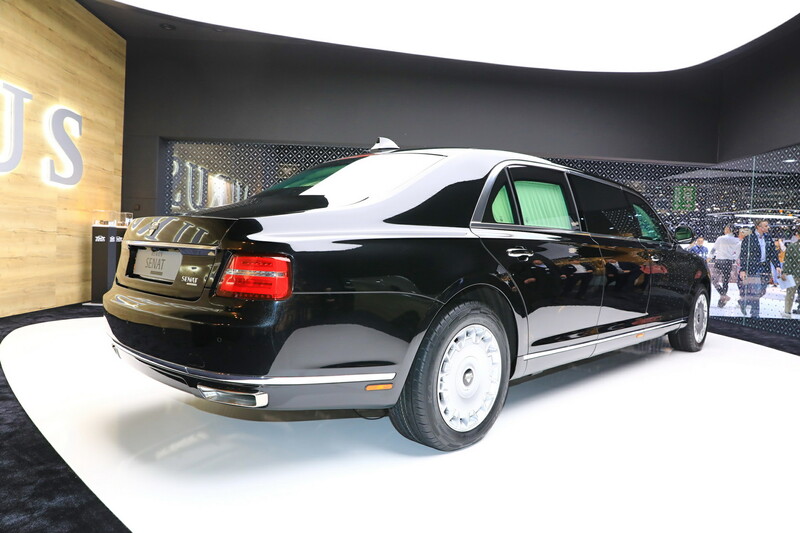 Reminds me of the Toyota luxury Rolls wannabe thing as well as a locomotive. 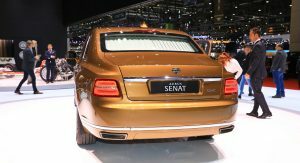 Overall, properly gaudy car for a rich, unsophisticated, despot. You’re wrong. 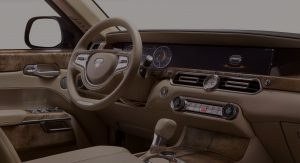 Porsche engineering company commissioned by NAMI performed instrumental studies for the new engine. 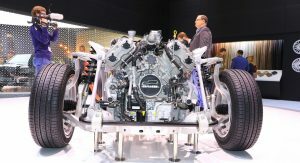 Other automotive companies are ordering the same research: for example, Mercedes, Harley-Devilson. 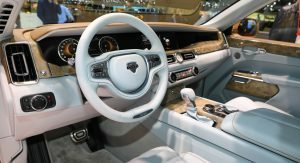 Because such equipment, as in Porsche engineering, is only for two or three companies in the world. 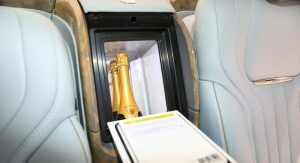 To create such a laboratory in Russia is not economically feasible: the equipment will be idle. 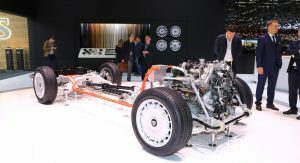 There is no information that the creation of the transmission, the electric engine was ordered in Porsche engineering. How many vodka bottles included for purchase? 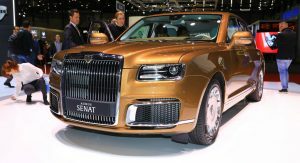 Why would anybody pay Rolls money for a Russian car, nation that is best known building Ladas. 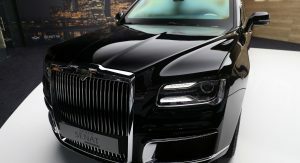 Only Russian oligarchs but no western would buy. Google ZIL if you don’t already know. 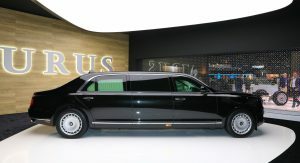 How many ZIL limos were sold outside the USSR? And how many were actually made? 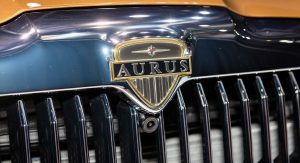 Cadillac made more cars in one day than ZIl in one year. 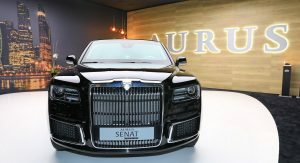 2740kg but this Aurus is not a sports car, I think they put a long gearbox. 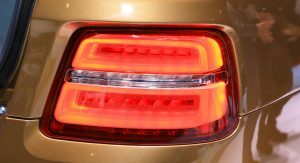 This is a Copy paste of so many existing cars; most obvious RR, Bentley and 300c for headlamps. 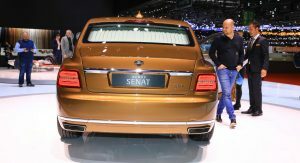 A similar car and the car-copy is not the same thing. 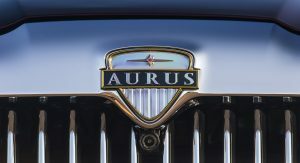 Aurus is a commercial project. 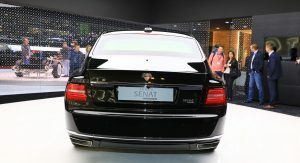 You can’t make a car look like nothing and say: “this is a premium car, buy it.” The market will not accept such a car. 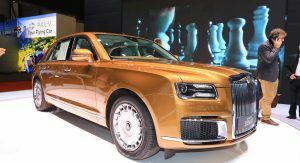 Because for the market knows: the premium car is a rolls-Royce. 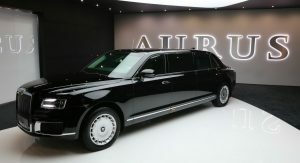 Therefore, Aurus is similar to rolls-Royce, but is not a copy of It. Given that Putin has been declared the Planet’s official Bond villain by the Zionist Occupation Governments of the West, then he should ordered them to go for max bad with the design. 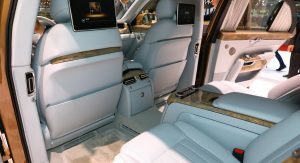 Yes, Rolls is way more expensive, but its interior is probably trimmed in more expensive leather and wood and it has more hi-tech options. 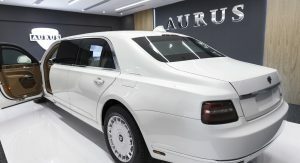 Yes, chinese car is not the most beautiful. 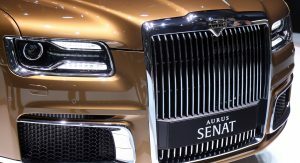 BUT they can be bought right now and the production of Auris is delayed AGAIN. Initially they were going to start the sales in December 2017 or January 2018, now they are talking about the end of 2020. You used the word “probably.” This means that you have little information and you have to guess. I also have only the information that can be found in the Russian-speaking part of the Internet. 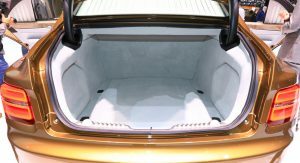 Let’s wait for information from automotive publications. 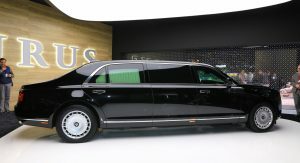 Pre-orders for Aurus are accepted from February 15 (so still aurus is a commercial project). 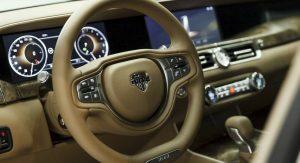 I hope in the summer should be the first article in the automotive press. they think that they can find more than 5000 people that want to buy one? Well Marussia said the same about their cars, and now they are dead and only producing like less than dozens. 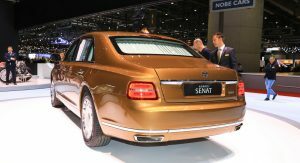 I wonder why more cars don’t come with drapes. Russia shows to the world what they can do from nothing. 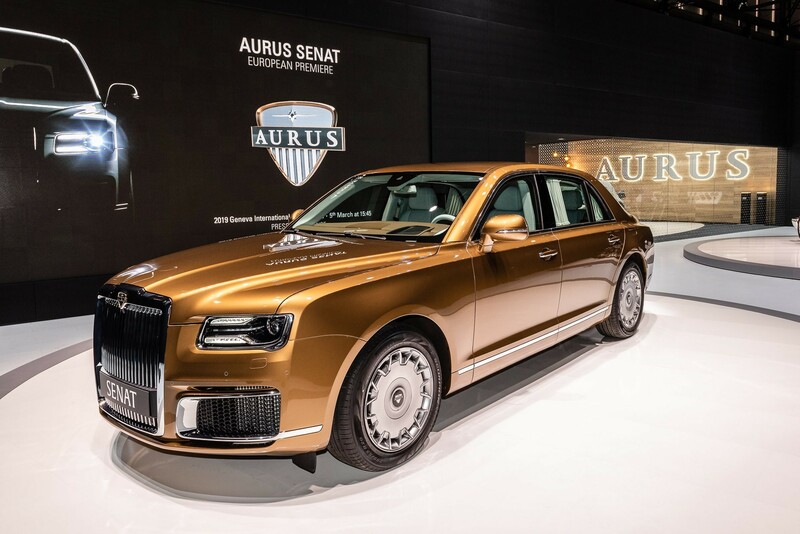 I like it but what about the Aurus Komendant? 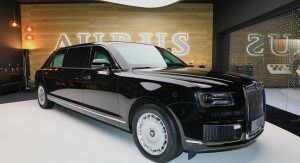 So now when you see Aurus on European roads you will know that Putin told that person to but it. 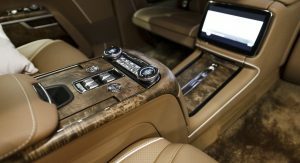 If I remember correctly, these are priced higher than the S550 in Russia. Now imagine the price in Europe. 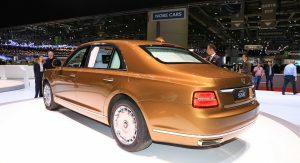 I like Rolls Royces and Bentleys, so this looks fine to me. 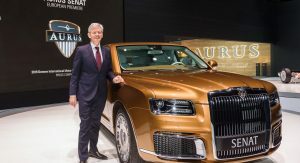 But being such a blatant ripoff is a naive and simplistic idea of “fancy stuff rich people like.” Kind of like people who win the lottery and immediately buy concrete statues of lions to put at the entrance of their driveway. 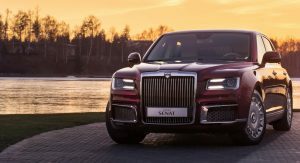 It’s a squandered opportunity for Russia to make something truly impressive and unique. 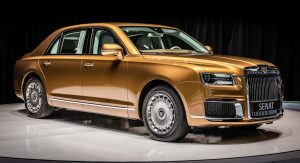 Too obvious copy of rolls royce design but less balanced and imposing overall which makes it look like a cheap knock-off even if it were good and expensive. 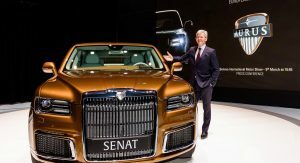 I want the sedan. 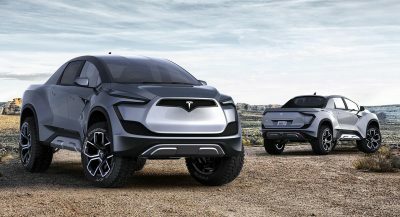 If they make SUV, I’ll go for it. 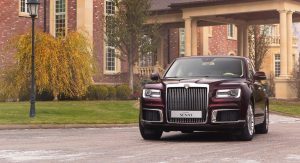 Very very Rolls like!! Not good at all. 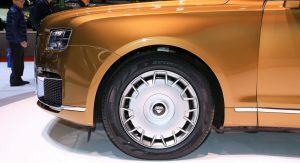 They should learn from Bentley when they separated from Rolls they had their unique design. 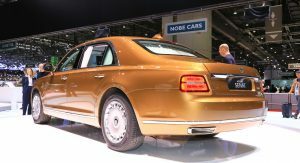 Look at the Mulsanne for example. 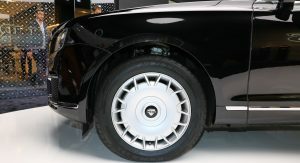 Shame even the design lines not only the front scream rolls. 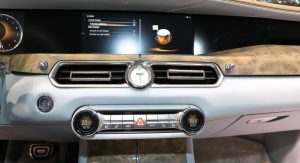 Does it come with an integrated Facebook interface so you can troll American politics and sway elections while eating McDonalds with Grey Poupon. 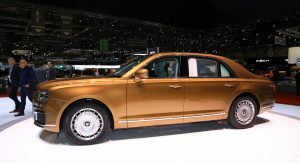 I don’t get how Bentley and RollsRoyce can let this happen… Maybe they fear Putin would kick them out of Russia? It’s a shameless copy/paste this design. 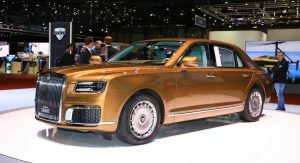 Express your outrage to the Chrysler 300. 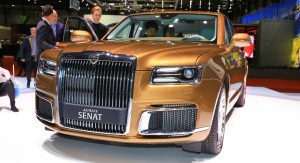 I don’t really see the point of this car except being used by Russian politicians to look nationalist. They speak target like Mideast and China but aren’t they aware those people value quality and brand? 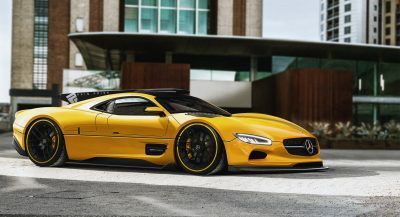 They would choose Mercs, BMWs and Audis than this new company. The middle Eastern princes already expressed the interest in this thing. After all, you can drive something no one else has. 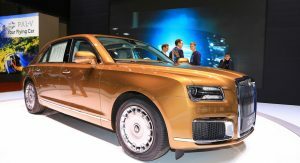 Wow so not just China but now Russia is ripping off designs from other automakers. 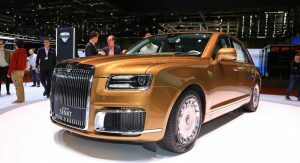 This is almost a Rolls knock off. 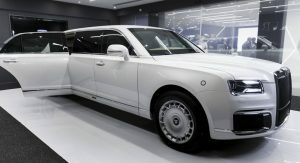 Try to design an armored limo without looking at other automakers. 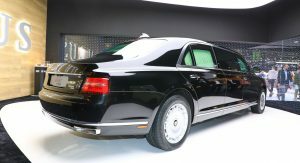 Did you ever see a limo without a huge chrome grill? 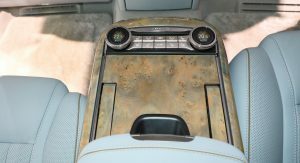 So you thought the Russians would make their limo with no grill? 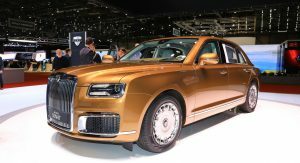 I’m just glad that Aurus, Hongqi, Toyota (Century), Bentley, Mercedes-Maybach, and Rolls are pushing the luxury envelope. Wheres the US (Cadillac & Lincoln) thou! ?